How to make the most of this opportunity and use social media to increase your ICCA Congress experience? 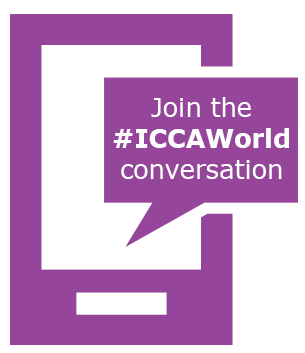 Search for #ICCAWorld on Twitter and connect and engage with other ICCA members. Use hashtag #RoadtoArgentina to share images, tips and advice during your journey and preparations for the #ICCAWorld Congress in Buenos Aires. Like our Facebook page on facebook.com/iccaworld, and share your pictures and videos by tagging the “ICCAWorld” page in your post. Join the “54th ICCA Congress” Event page on Facebook to stay up date with the latest practical event updates. Join the ICCA member-only LinkedIn Group. Follow us and share your pictures on Instagram using #ICCAWorld. Twitter is your best friend during meetings and events: All messages are open to the public, messages are quick and short, and you can easily group and find relevant messages with a hashtag. An #ICCAWorld Twitter- and Instagram feed will be shared on social media screens throughout the venue during the Congress. Conferences & tradeshows can be sources of wonderful ideas. By sharing your key takeaways on Twitter, you can share your peronal notes with other participants. Have a look at the key takeaways shared by 2014 #ICCAWorld Congress participants, grouped by Congress education session. They read as shared notes from the education sessions. This is one of the main purposes of the ICCA community: Sharing knowledge and expertise, and this is a great way to do it online. Please help us share this useful content, using hashtag #ICCAWorld on Twitter. Connect with the speaker by mentioning his/her Twitter account in your posts. You can find the Twitter accounts of the speaker(s) in their profiles in the Spotme event app, which are included in the Congress Education Programme in the app. Will you top the chart? We will acknowledge the top 3 most active contributors as “#ICCAWorld online ambassadors”. You can check out the live rankings on the social media feeds on the screens in the venue and the ICCA Congress website. Take a picture of yourself with some of your ICCA member friends you are meeting at the Congress and share it on Twitter or Instagram using hashtag #ICCAFriends. Selfie sticks are available so you can include more #ICCAFamily members! The most popular #ICCAFriends shot wins a special prize! After all, without fun no game, right?! We look forward to seeing you at the Congress, and connecting with you online!